MUMBAI/NEW DELHI: A crackdown on unlicensed abattoirs in India’s most populous state has spread to other states ruled by Prime Minister Narendra Modi’s party, as Hindu hardliners press a political agenda that risks alienating the country’s Muslim minority. The move started after Modi appointed Yogi Adityanath as chief minister of Uttar Pradesh state following the Bharatiya Janata Party’s (BJP) landslide victory in elections there this month. The demands by right-wing Hindu groups to stop the slaughter of cows, considered holy in Hinduism, could stoke communal tensions with Muslims, who dominate the meat industry and make up 14 percent of India’s 1.3 billion people. Most of the beef produced in India comes from buffalo rather than cattle. India’s history is pockmarked by horrific Hindu-Muslim communal clashes. In Modi’s home state of Gujarat, 1,000 people, mostly Muslims, were killed after a wave of riots in 2002 when he was chief minister. A Supreme Court investigation found no case against Modi, who denied any wrongdoing. 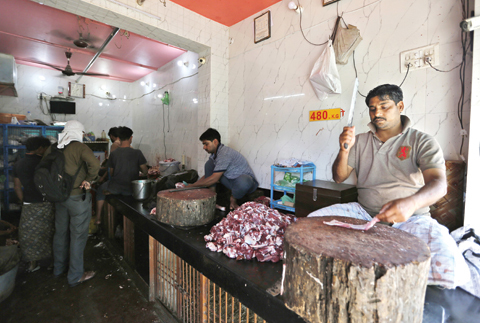 Adityanath ordered the closure of abattoirs operating without licences soon after taking over as chief minister on March 18. “If it is legal, nobody has a right to stop it. But if it is illegal, why should this be allowed to function? We believe in the rule of the land,” said Rajiv Tuli, media coordinator of the Rashtriya Swayamsevak Sangh, the ideological parent of the BJP. A senior BJP official also defended the action, saying it was part of the party’s election manifesto in Uttar Pradesh and followed through on the stand taken by Modi during 2014 general election campaign, when he spoke out against India increasing meat exports. “Even Modiji vowed to put an end to pink revolution during the 2014 election campaign, so there is nothing wrong in shutting down illegal shops,” the official said, using a term of respect and referring to the modernization of meat and poultry processing units. Several other BJP-ruled states, including Jharkhand, Rajasthan, Uttarakhand, Chhattisgarh and Madhya Pradesh, have followed suit, ordering closures of abattoirs operating without licenses, media and officials said. On Tuesday, Hindu vigilantes forcibly shut down a KFC outlet in Delhi’s satellite city of Gurugram, in the state of Haryana also ruled by the BJP, for selling chicken during the nine-day festival of Navratra when Hindu devotees fast and stay away from meat. “We have not received any notification from the authorities on limiting operations during the Navratras…,” a KFC India spokeswoman said. “We would like to reiterate that KFC has the highest respect for the cultural and religious beliefs of all communities and believe that consumers are free to make choices and decisions.” KFC said its outlets were operating normally in other states. Senior Jharkhand government official K G Rahate said authorities were acting against illegal abattoirs keeping in mind “overall issues of public health, hygiene and safety”. Raghubar Das, chief minister of Jharkhand, also issued advertisements in local papers to appeal to meat sellers to follow his government’s instructions. In Rajasthan, 16 illegal slaughterhouses were shut down last week, a government official said. The closures have led to fears of meat shortages and disruption of exports of buffalo beef and other meat products. The move by a number of state governments has led to “a huge sense of apprehension in the minority section,” said Neerja Chowdhury, a political commentator. “The debate is beyond legal and illegal. Only recently cow vigilante groups have burned down slaughter houses, creating an environment of insecurity,” Chowdhury said, referring to a series of attacks in Uttar Pradesh. After his landslide victory in Uttar Pradesh, Adityanath should have adopted a more inclusive approach, she said. India is one of the largest exporters of buffalo meat, selling $4 billion worth of beef in the 2015/16 fiscal year. Its biggest buyers included Vietnam, Malaysia and Egypt. Uttar Pradesh is the biggest producer of buffalo meat in the country, and exporters said the latest crackdown will hurt business.